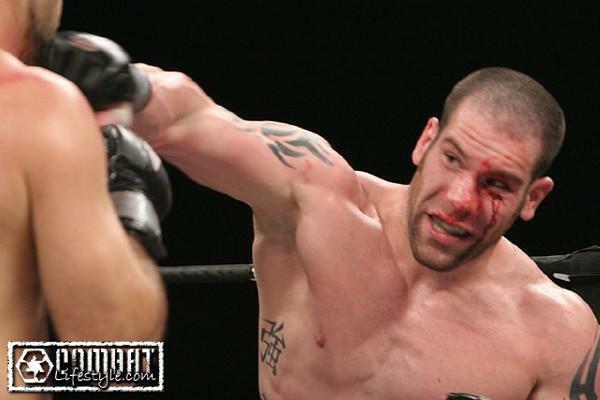 Almost a year and a half ago I first heard of this fighter named “Brutal” Brendan Barrett. I was at a local MMA gym and I saw the poster for an event by Raging Warrior Promotions in Boalsburg, Pennsylvania called “Mayhem on the Mountain”. The main event was between JA Dudley & Barrett, and the poster did a great job of selling the event. It left a lasting impression on my mind, and I began to follow Brendan‘s career. Barrett has fought some well-known opponents in his professional career, losing to former TUF competitor Alex Schoenauer and current UFC veterans Tim Boetsch & Costas Philippou. Since these fights Brendan has gone on to become the Heavyweight Champion in several promotions. (Raging Warrior, Locked in the Cage, XFE, and Ring of Combat) Back in April he defeated Silvio Santos by KO in just 33 seconds to become the ROC Heavyweight Champion. The moth before that win over Santos I had met Brendan in person when he attended Complete Devastation 8 in Altoona. He was there to support a friend and team-mate who was fighting that night, and I had the opportunity to introduce Barrett to the new owner of the promotion and discuss how having the “Brutal” one fight on a Complete Devastation fight card would be good for him, the promotion, and Central Pennsylvania fight fans. The fighter I had suggested to have matched-up with Barrett was Virginia Heavyweight Keith Bell. The promoter as well as Brendan seemed to like the idea of putting two exciting Heavyweights against each other for local MMA fans to enjoy watching, and interestingly enough, the day after Barrett defeated Santos in just 33 seconds Keith Bell defeated previously undefeated Azunna Anyanwu at XFE 22 with a devastating head kick KO in just 12 seconds. Complete Devastation is having an event in November, but sadly this fight is not currently scheduled on the fight card. Hopefully in their next event the promotion will get these two titans signed to a main event that surely will be one that other fights get compared to in the future. But before that fight with Bell could possibly happen, Brendan Barret is set to defend his ROC title against a very tough Miodrag “Pele” Petkovich at Ring of Combat 46 on September 20th in Atlantic City. Barrett is an excellent fighter, but he is a role model outside of the cage as well. I have three MMA fighters that I respect completely & look up to. One of them is former UFC veteran (and former WEC Light Heavyweight Champion & decorated Marine) “All American” Brian Stann. Another is Nick Newell because of how he hasn’t let being born without his left arm below the elbow limit him from being successful in MMA and life. The other is Brendan Barrett for how he is a true champion & a total professional inside & outside the cage. I have seen photos of Brendan visiting people in the hospital, and the way he visited one fan, a woman named Rosa – who Barrett says taught him “what it truly means to fight the good fight and never give up no matter what” – made me realize that if I could be more like Barrett it would be a very good thing, in life as well in competition. I was lucky enough that Brendan took time from his busy schedule as he was preparing to face Petkovich this weekend for him to answer a few questions. You have to respect someone who will take time away from getting ready to defend their title against what is probably his most dangerous opponent to date to do an interview. I am grateful for this interview. This interview is one of my favorites, and I hope you enjoy reading about Brendan Barrett as much as I have putting this article together. Here’s 10 Questions with “Brutal” Brendan Barrett. 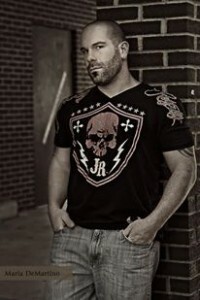 My name is Brendan Barrett, I’m a heavyweight pro MMA fighter. I never had an amateur fight, found out two weeks after my first fight that it was a pro event and never looked back. My current record is 8-5-1 (1NC) I currently hold the Raging Warrior HWT belt, the Locked in the Cage HWT belt, the XFE HWT belt, and the Ring of Combat HWT belt. I train at numerous gyms all over between NJ, Pa, NY, and even out in Oregon. This allows me to learn a much more diverse set of skills and to continually get a new look from different sparring partners. 2. How did you get started in MMA? I was in college, finishing up a dual degree and planning on going to law school when I was in a car accident. I was sitting at a red light waiting for it to turn coming back from a trip to the mall for a study break and was hit from behind. Because of my injuries I wasn’t able to finish my senior year and had to take a medical withdraw half way through my second semester. I used up all of my scholarship money and financial aid so I was working numerous different jobs trying to get money to go back to school. I was miserable and borderline depressed. After awhile I did a lot of soul searching and meditating. I realized that the only time I was truly happy in life was when I was involved in a sport and competing. At my age there was not much available to me as far as sports and mixed martial arts was starting to become more accepted so it seemed like a natural fit. 3. What gym(s) do you train at, and what is it like training there? This training camp has been different because I met a boxing promoter, Sal Musumeci who flew in his top trainers from Los Angeles, Buddy Bereal, and one of his top undefeated heavyweight boxers from Illinois, Natu Visinia. Buddy fine tuned my striking and helped tighten up a lot of my technique and footwork while Natu pushed me harder and harder each day. Natu is 9-0 in boxing with 8 KO’s and also had 6 professional MMA fights before he switched over to boxing so he worked with me on the ground as well. At 6’2” 280lbs he has been the biggest training and sparring partner I have had in a long time if not ever. Natu is light on his feet for a guy his size and has tremendous power so he is definitely a guy to look out for and keep an eye on. 4. What do you feel your strengths are as a fighter? Other than my heart and determination, I feel that my strengths as a fighter are my speed and strength. These two attributes combined translate into a lot of power and the ability to utilize my footwork to land strikes and set up takedowns. At 240lbs I move much faster than guys even lighter than me so I see that presenting a big problem for many guys in the heavyweight division. 5. What do you feel you need to work on to be a more complete fighter? I want to continually work on all aspects of the sport. I feel that I am a very well rounded and complete fighter with the 16 years of wrestling experience before I started fighting and the amount of time and dedication I put into getting my striking up to the level of my grappling. The sport is always continually evolving and changing so to continue to be a successful fighter one must always stay humble and always be open to learning new things and making changes to their training camps when necessary. 6. You are set to fight Miodrag “Pele” Petkovich on September 20th in Atlantic City for Ring Of Combat XLVI. How are you preparing for this fight, and what do you expect from your opponent? Miodrag will probably be the biggest test of my career to date. He has such a tremendous amount of experience between the amount of time he has been training and the level of competition he has faced, especially internationally. To prepare for this fight I have focused on everything because I need to be ready for anything. I expect my opponent to come out well prepared and to potentially present some situations I may have never been in so I have made sure that I am not only physically prepared, but mentally as well. 7. Which of your fights is your favorite? Is there a fighter you wish you could fight again, if so which fighter would that be? It would be hard to say my last fight wasn’t my favorite, but not because it ended in a very quick and violent knockout, but because it was also my fourth straight independent championship belt I won in a year. It felt like a culmination of all the hard work, dedication, and sacrifice that I have put in over so many years was paying off by winning the biggest title I have to date back in Atlantic City where my career started. I was also very pleased because in the fight I studied my opponent, I searched for the right opening, and I took it when I saw it and was fortunately able to end it quickly and without being touched. I used to have one or two guys that I wanted to fight again more than anything, but I let it all go. I now focus on what is in front of me, not behind me and if I ever cross paths with any of them again than so be it. 8. Who are some of your role models? My role model in life is my grandfather Charles, Scott. He was the hardest working man I have ever met who would do anything for his family. Later in his life he was diagnosed with a degenerative neurological disease. As the illness progressed, never once did he question “why me” or get bitter or negative. He remained positive through everything he endured, even as he later lost the ability to even speak. In his last hours he showed me even more so what it meant to be a true warrior in life. He fought for every last breath and never let go till he absolutely had too. In his last breath with his eyes closed he smiled. I know he is always watching over me and in there with me every fight. I can only hope that I have even half of the warrior in me that he had in him. Another person who has inspired me in a similar fashion is my friends’ sister Rosa Perez. She fought a fight she had no say in being in and stayed positive while she battled for every day she had left, just like my grandfather, to spend even another moment with her children and family. People like my grandfather and Rosa are a true inspiration and example of the type of person we should all strive to be. 9. What are your goals in MMA? There has been a good amount of buzz and talk about what may or may not happen after this fight, but for the time being I am going to stay focused on what is right in front of me and worry about what is next afterwards. If I don’t go in and take care of business, all the speculation and talk means nothing anyway so first things first, Sept 20th. 10. Is there anyone you would like to thank? First and foremost I’d like to thank God for giving me the gifts and abilities to do what I do. Without Him I wouldn’t be here or even doing this interview. A few people I would like to thank are of course Sal Musumeci, Buddy Bereal, and Natu Visinia for all the help, hard work, and training they gave and provided for me. I’d also like to thank my right hand man, my Ninja 2, Matty Rock for always being there for me, helping out however he can and standing by me in the trenches during the rough times. My graphics designer, Keith Hubacek of Pure Subculture, came up huge for me and took a major amount of work off my hands in helping with my graphic design, fight shirts, and fight banner so a big thank you to him. I’d like to thank Lou Neglia for the opportunity to do what I love, all the fans that come out and support me, my family for being supportive and understanding as they can be of my career choice, and all of my other trainers and training partners over the years who have helped get me where I am today. A special thank you to all of my sponsors as well, because without them I wouldn’t be able to train the way I do and prepare how I need to. Here is a list of them: J.A. Tree Service, Vibram, DIB Leasing Inc, Vespa of Philadelphia, Coastal Sign and Design, Jersey Royalty, Enzymes.com, Collins, McDonald & Gann, P.C. Attorneys at Law, Sweet Jenny’s, The Shack Board Shop, Kuhl Marine Construction, RockTheGalaxy.com, and 2Nite Premium Italian Vodka.